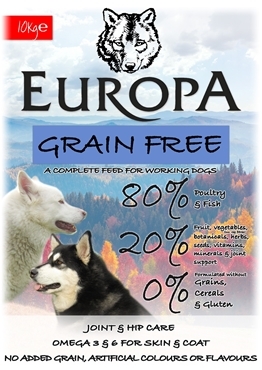 Europa Grain Free 80 / 20 is a NO GRAIN high meat content complete food for dogs aged from 8 weeks to old age. Using only the finest ingredients Europa has created a blend of 80% Poultry & Fish with 20% Fruit, Vegetables, Botanicals, Herbs, Seeds, Vitamins & Minerals with added joint care. Grain Free Food is now one of the most popular ways to aid dogs with skin allergies,dietary intolerance, obesity, diabetes, and digestive problems. Freshly Prepared Chicken 36%, Dried Chicken 22%, Sweet Potato, Freshly Prepared Turkey 11%, Potato, Freshly Prepared Salmon 4%, Freshly Prepared Pollock 4%, Chicken Stock 1%, Dried Duck 1%, Pea Fibre, Salmon Oil 1%, Dried Egg, Minerals, Vitamins, Linseed, Dried Apple, Dried Carrot, Seaweed, Dried Spinach, Dried Cranberry, Tomato Pomace, Hip & Joint Care (Glucosamine 180mg/kg, MSM 180 mg/kg, Chondroitin 125 mg/kg), Camomile Powder, Burdock Root Powder, Aniseed & Fenugreek, Peppermint, Marigold, Grapeseed Extract, Green Tea Extract, Dried Dandelion, Dried Bilberry, Ginseng, Thyme, Majoram, Oregano, Parsley, Sage. Crude Protein % 32, Crude Oils & Fats % 16, Crude Fibres % 3, Crude Ash % 7.5, Moisture % 8, Omega 3:3.4%, Omega 6:1.4%. All dogs are different and the guidelines should be adapted to take into account the breed, age and activity levels, etc of the individual dogs.